I just wanted to make a quick post to let everyone know about a couple of new styles we just rolled out. 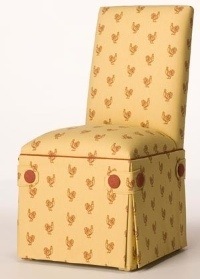 The first is called the Elizabeth Parsons Chair. It has a distinctive "crown back" that definitely makes it stand out from the crowd. We've also introduced a customer inspired design. 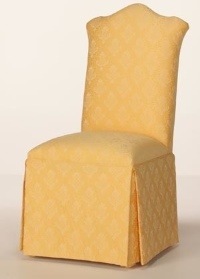 The Bordeaux Parsons Chair has a traditional kick-pleat skirt accented by button tabs at each corner. The contrasting fabric used for the buttons and the welt running around the seat and back is a real crowd pleaser for everyone that has seen it. Look forward to more updates in the near future. We have some big announcements coming out in the next few months that I think everyone will be excited about.